It’ll be free from shortly after 0700 GMT on Sunday 8 September until roughly the same time on Tuesday 10 September. Grab your chance and get it while it’s free! As always, if you get one of my books please leave a review of it on Amazon as this helps it to do better in the Amazon search engine. Thanks! There’s no question that food poisoning is a deeply unpleasant and, at times, a dangerous and even life-threatening experience. And it’s on the rise, too, with media reports of outbreaks of salmonella, listeria, E. coli and other nasties reported almost everywhere you turn. Yet it needn’t be like that. The principles behind safe food handling are straightforward – you don’t have to have a degree in bacteriology to keep your food germ-free. And the food handling rules based on those principles are easy to follow – you don’t need an industrial freezer or your own pasteurising plant. Author Kay McMahon is a qualified chef and an expat with over two decades’ experience of living, eating and cooking in some of the world’s more challenging environments. She’s worked in and managed domestic and commercial kitchens in Europe, the Middle East and South Asia, with no reported casualties so far. 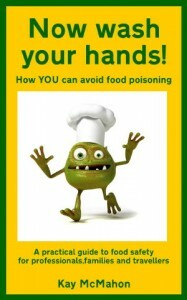 So if you’re worried that your next big trip overseas might result in several more little trips in rapid succession, or that your Christmas turkey might give your family members an unexpected and unwelcome intestinal gift, read this book and find out how YOU can avoid food poisoning. You can buy Now wash your hands! through any local version of the Kindle Store. For your convenience, I’ve linked to the .com and .co.uk versions, but there are Kindle Stores for Germany, France, Italy, Spain, Japan, India, Canada, Brazil and Mexico too. If you have the time, I’d appreciate it if you could rate or review the book on Amazon too – it’s always good to have feedback. Thanks! Get some fantastic free university courses!